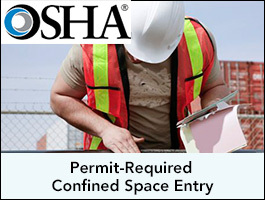 This OSHA #2264 course covers the safety and health hazards associated with permit-required confined space entry. Course topics include recognition of confined space hazards, identification of permit and non-permit required confined spaces, use of instrumentation to evaluate atmospheric hazards, ventilation techniques, developing and implementation of a confined space program, proper signage, and training requirements. This course features workshops on permit entry classification, instrumentation and program development.